WWT's waterlife magazine, January/March 2012 ". . . an excellent new book". "... an interesting and inspiring read." "... entertainingly relayed ... a definitive account of their story has long been overdue and this book fills the gap admirably" says Ed Parnell. "It's been an extraordinary story of persistence and adaptation, which John Buxton – on whose Horsey Estate the colony first became established – has last set down on paper. 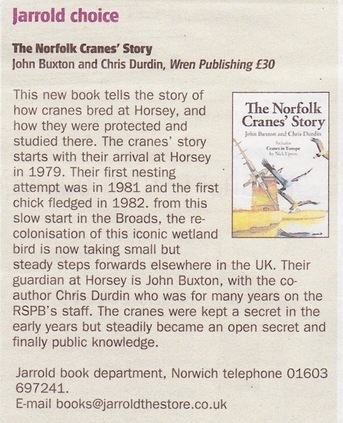 The Norfolk Cranes' Story, co-authored with former RSPB press officer Chris Durdin, is a heartening and enthralling narrative. 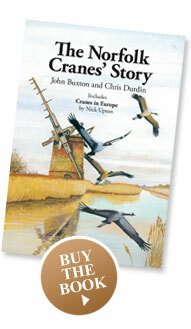 "The Broadland cranes, in their early years, were one of the bird world's best-kept secrets. Now they are east Norfolk's greatest spectacle." British Birds, September 2011. Mike Everett says, "Quite simply, it is splendid." Here's the review in full. Or read the full BB review online here. Above: Eastern Daily Press, books pages, 23 July 2011. The main EDP coverage was a double page spread on 13 August - too big to scan! 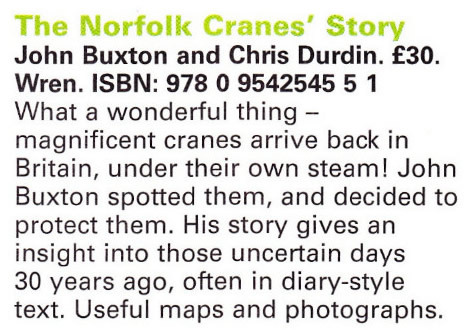 BTO review: "The combination of clear readable prose and the relaxed familiarity of the authors with their subject makes the Cranes’ story interesting for all readers, not just ‘craniacs’ or Norfolk folk." Heather Pymar, British Trust for Ornithology. Derek Moore, former director of Suffolk Wildlife Trust, says: "There are dozens of books on birds published every year but only a few add real value to the ornithological literature. 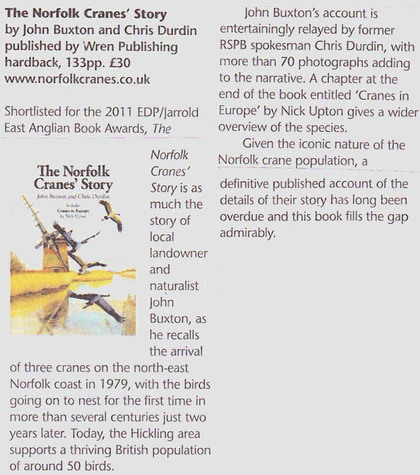 Such a book is The Norfolk Cranes' Story." More on Derek's blog here. David White, from RSPB Lakenheath Fen nature reserve, says the book "... is a fantastic read" and that it helped to solve a puzzle about their birds' behaviour. Read more on David's Lakenheath Fen blog here. 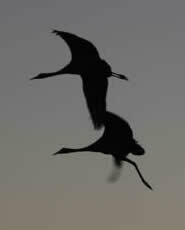 "Here we have the history of dedication fostering a species' struggle to reclaim its old haunts. 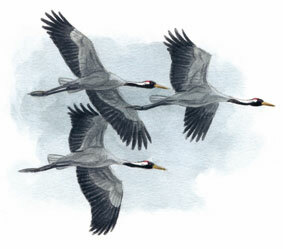 "This is an easy to read history and virtually a handbook for crane conservation. 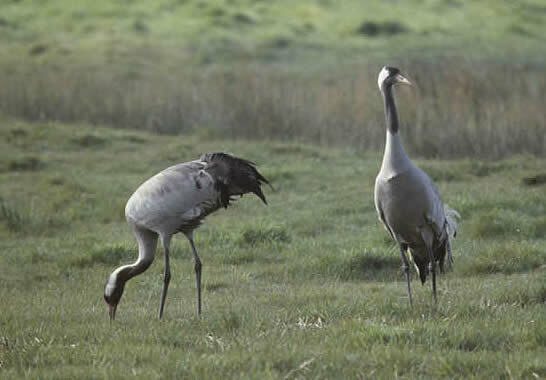 It's many years since I saw these very beasts in the windswept corner of eastern England and was delighted by their dance, just as I was delighted by this account." 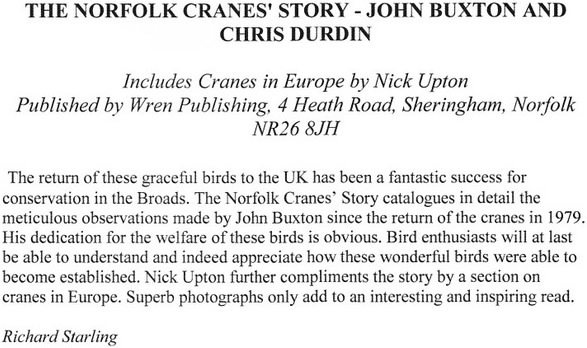 So says Bo from Fatbirder: click here for the online review on the Fatbirder website. Read the full BB review (on the left) online here. "my one extravagance of the day ... well, apart from that new book on ‘The Norfolk Cranes’ Story’ ..." (no longer online). The bustle is raised when a crane is excited. Other reaction is also very positive. "I took it home to read and was glued to it. I’ve long been fascinated by the Broadland cranes ... to have such an in depth insight into their story and in such a well produced book was such a treat. 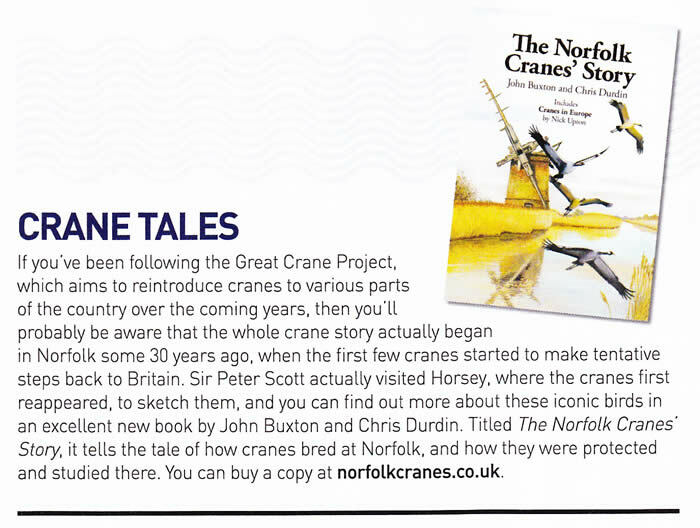 A brilliant book that will entertain and delight and reveal to all the fascinating truth behind the Norfolk cranes’ story." 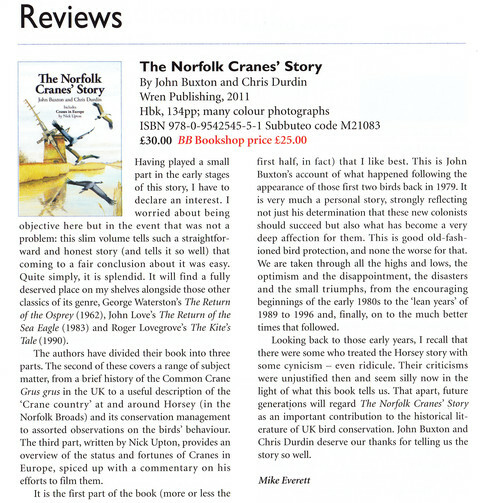 The book is "very readable, informative and excellently done" according to Peter Allard, joint author of Birds New to Norfolk, The Birds of Norfolk and three other bird books relating to Norfolk. Editors of magazines or journals are invited to contact us about arranging a book review.